GALION — Galion Youth Baseball is hosting the 12U District 7 Little League All Star Games at Heise Park, starting Saturday. Galion’s 12U team was an easy 18-3 winner vs. Clyde on Saturday. They play again Sunday at 4 p.m., vs. the winner of a Saturday game between Shelby and Bucyrus. If they keep winning, eventually they could end up playing for a title in Williamsport, Pennsylvania. McMullen said the fact so many business owners take an interest in youth sports makes life a lot easier for all of them. Members of Galion’s 12U team include Braylen Hart, Bryce Kimberlin, Carter Smith, Conner Ganshorn, Drew Yetter, Gage Weaver, Jack Karam, Jayden Leach, Justin Lester, Kooper McCabe, Landon Campbell, Nicholas Eachus andNicholas McMullen. The coaches are Bill Ganshorn, Steve Hart and Dan Nay. He added that if they play within themselves and keep their minds on the game, they can be successful. “To win, our players need to stay focused, follow the game plan that coaches have put in place and play as a team,” Ganshorn said. Teams taking part are in the Galion touranment include Galion, Fremont, New London, Bellevue, Clyde, Shelby and Bucyrus. The other opening game on Saturday is New London vs. Bellevue, also at noon. All games are at Heise Park. The tournament continues Wednesday with two losers bracket games. There also are games Thursday and Friday at 6 p.m.. The District 7 championship game is Saturday, July 8 at 6 p.m.
Galion’s 10U and 11U all-star teams also are tournament bound. Their tournaments startenext week. The 10U tournament begins July 8 and will be played in Clyde. The 11U tournament also starts July 8, in Shelby. Winners from these District 7 tournaments advance to the state tournaments. Members of the 10U team are Arius Swaim, Braxton Prosser, Carson Campell, Carter Walters, Jimmy Hardy, Johnathan Maran, Korey Walters, Landyn Prosser, Max Albert, Quinn Miller, Trey Longwell. The coaches are Ryan Alber, Tom Swaim and Sean Walters. The 11U team is made up of Carson Frankhouse, Cooper Kent, Derek Prosser, Holden Hunter, Hunger Miniard, Kael Longwell, Linkon Tyrrell, Logan Keller, Nathan McMullen, Quinn Frankhouse and Trevor Vogt. Coaches are Tim Keller, Gary Frankhous and Matt Tyrrell. Russ Kent | Galion Inquirer Workers were busy Friday mornings prepping the fields at Heise Park for Saturday’s 12U District 7 All-Star game. Action kicks off at noon Saturday, with Galion taking on Clyde and New London taking on Bellevue. 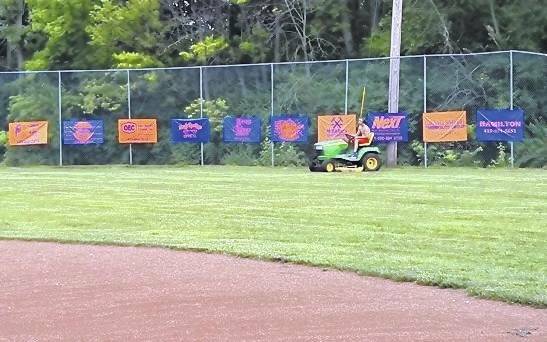 https://www.galioninquirer.com/wp-content/uploads/sites/38/2017/06/web1_little-leaguers.jpgRuss Kent | Galion Inquirer Workers were busy Friday mornings prepping the fields at Heise Park for Saturday’s 12U District 7 All-Star game. Action kicks off at noon Saturday, with Galion taking on Clyde and New London taking on Bellevue.